Sculptures are society's testaments of the people, the culture and the history -- from gods divine to wars glorious. The objective of making a sculpture is often manifold; beauty is paramount but sculptures also stand as a form of representation. Sculptures are, arguably, representational art. Therefore, it comes not as a surprise when a large number of sculptures in our country are about our Liberation War, and when we talk of sculptures surrounding this theme, Aparajeyo Bangla, sculpted by Syed Abdullah Khalid and located in Kala Bhaban of Dhaka University campus, is a name that immediately comes to mind. The sculptor has made the role of farmers in our Liberation War immortal -- the figure in the middle is that of a farmer holding a grenade in one hand and a rifle on his shoulder. On his side is a woman carrying a First Aid Box; perhaps, the figure, which also represents the brave contributions of women in the war, is a nurse. On the other side of the farmer is a university student holding a rifle. What might strike a keen observer are the facial expressions and body structures crafted and carved so finely. The three figures stand upright, which gives an aura of confidence. The university student even has his face slightly tilted up. To many, the facial expressions and postures of the three freedom fighters show a cold, latent pride. Another sculpture in memory of the Liberation War is located in TSC. Shamim Sikder's Shoparjito Shadhinota is a rather complex structure depicting many dimensions of 1971 -- violence upon people and the mass killing of intellectuals, rebellious and heroic freedom fighters, the moment of victory, etc. On top of the base are several figures including a farmer, two freedom fighters, etc. The base itself is important, as it holds a fresco all round portraying many events and happenings of the war. Sculptures are artworks in 3D; it s necessary to view them from different directions to fully see it. Unlike paintings; only a whole 360 degrees later can a person come to comprehend a sculpture. Arguably, Sikder's most ambitious project stands on the traffic island on Fuller Road, near Jagannath Hall, a territory glorifying our history and heroes of our country. In the centre of the sculpture garden stands a structure of majestic height: the staggering 60 feet sculpture shoots up into the sky, defeating most trees and buildings. Right on top is our flag, just below it, is Bangabandhu. Then, like a flow of concrete, the structure cascades whilst showing many figures all around. The structure is a fountain too. Furthermore, there is sound system and lighting installed to reinforce the effect. Surrounding this are numerous small sculptures -- busts and statues of enlightened poets, musicians, intellectuals, etc. Walking on this sculpture garden hence evokes heavy emotions. However, an artist takes a very robotic, entrepreneurial and managerial standpoint when he actually builds it. “The artist should avoid being emotional at the time of sculpting. The artist must be conscious of what he is doing, he must comprehend the externalisation of the internal spirit and feelings of the art,” Sikder says in her book, Sculptures Coming from Heaven. Back to Bangladesh, another sculpture that has gained immense popularity is Raju Memorial Sculpture, which stands proudly on the traffic island of in front of TSC. The work shows a group of rebellious, young people, hand in hand, standing in a circle and facing outward. The faces show fury, aggressiveness and fearlessness. If you are thinking that this is yet another sculpture about the Liberation War, you are sadly mistaken! The sculpture is called Anti-terrorism Raju Memorial Sculpture, owing its name to a student named Raju who died from gunshots by terrorists while taking part in a protest against terrorism. The sculpture is built in his memory, and stands as a symbol of anti-terrorism and also love towards democracy and unity. Again, height plays a role. To get one of the best views, stand on the traffic island, close to the sculpture, and then look up. The clear blue sky high above makes these huge, solid figures look grand and powerful. 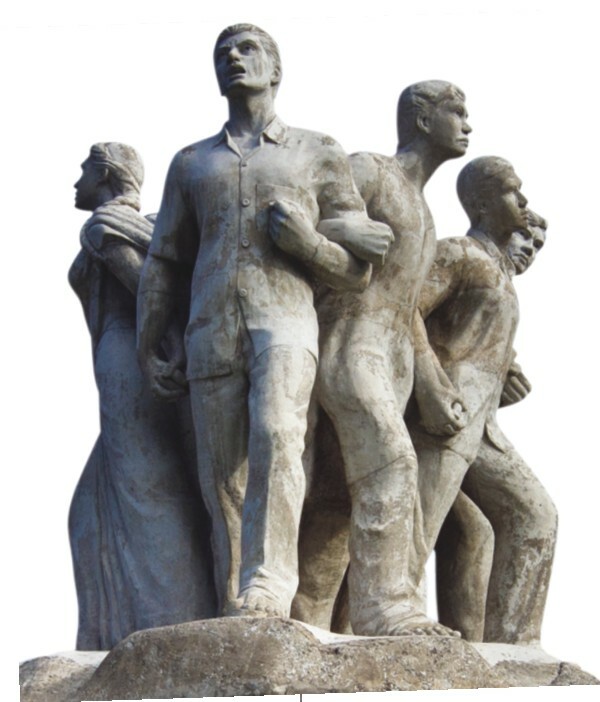 Dhaka University seems to host all the famous sculptures in our country, you might start to think. Although there are a few good structures all across Dhaka, this campus, and a few other others, are hubs. And speaking of movements, apart from the Liberation War, there are sculptures of Language Movement too. The biggest is of course, Shaheed Minar. But is that a sculpture? After all, a sculpture is any visual art in 3D. “Yes, Shaheed Minar is a sculpture. It has been made by artists. 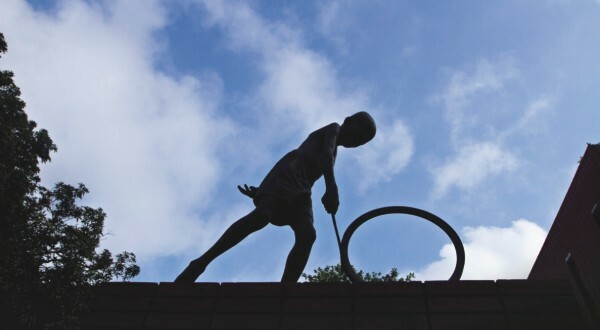 Although it has architectural significance too, the monument also symbolises and depicts certain things,” confirms Barai. And that discovery requires a lot of tools. Mukul Kumar points to a cluttered room with a grin, “A sculptor's workshop is quite similar to that of an engineer's. You need all kinds of things,” he says. Hammers, brushes and chisels form just tip of the ice-berg. Touching a sculpture is also a joyful experience. This is indeed another advantage of sculptures over paintings. Artists have argued that sculptures are meant to be touched in order to feel and understand them, and hence, even a blind man is not deprived of enjoying this form of art! But of course, in many cases it is not permissible or advisable to touch for practical reasons. For example, Bangladesh National Museum houses many statues of gods and goddesses, some dating as far back as the 8th century. The divine statues, many made from black-stone, are indeed a rare collection of beauty. Sculptures of black-stone are scarce in our times, though. “Concrete is the most common medium of outdoor sculptures in our country. Many stones which are used abroad are not found in Bangladesh, hence making them extremely expensive,” Barai informs. Not that there aren't sculptures of other mediums at all. Take Barsha Rani for example. Located in the traffic island of Tejgaon, the sculpture, made of metal, portrays peacocks. Another sculpture worth mentioning is Rajoshik, a fibre glass sculpture of a horse-carriage, located in the island in front of Dhaka Sheraton Hotel. And then of course there are sculptures that have become so popular that the whole area is informally named after them -- they have become landmarks, some of them portraying Bangladesh other than the rebellious aspect of it: Shapla Chattar and Doyel Chattar. Indeed, the number of sculptures we have seems endless, which is not seen positively by some extremist groups. Well, they are a minority. They may at times become partially successful, but they will never fully succeed: defeating people of Aparajeyo Bangla is impossible.